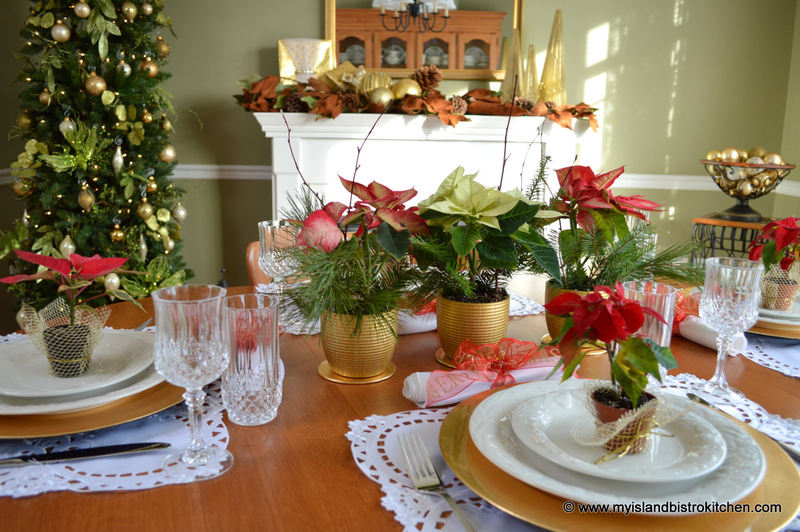 Throughout the holiday season, I am known to change tablesettings several times depending on number of guests and type of dining (e.g., brunch, lunch, dinner, etc.). That, however, doesn’t mean that I don’t rejig and re-use some of the same elements in more than one tablesetting. 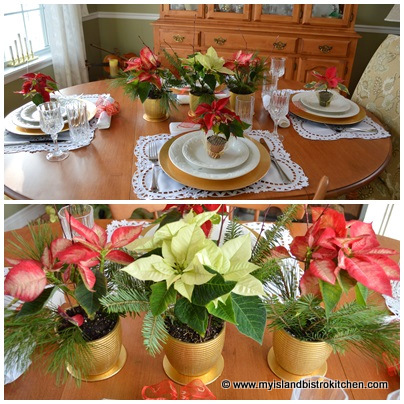 I recently shared my tablesetting for an intimate dinner for four where I clustered three poinsettias in the center of the small round table and set a miniature poinsettia at each place setting. 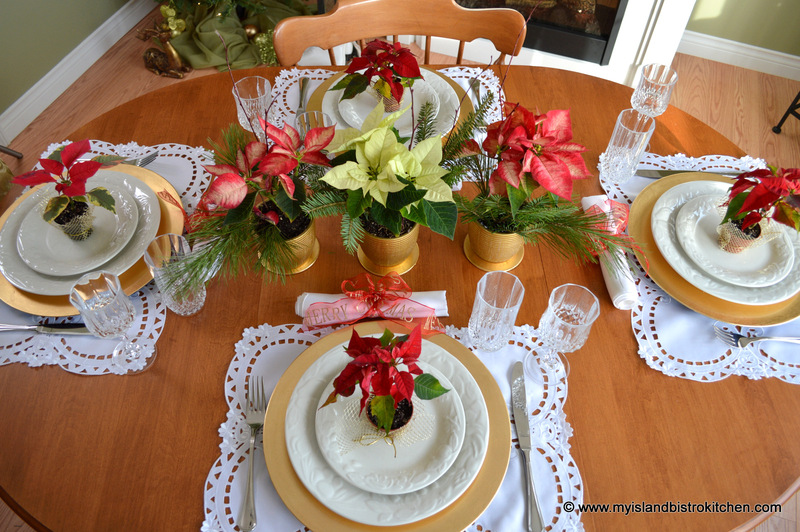 To view this tablesetting, click here. 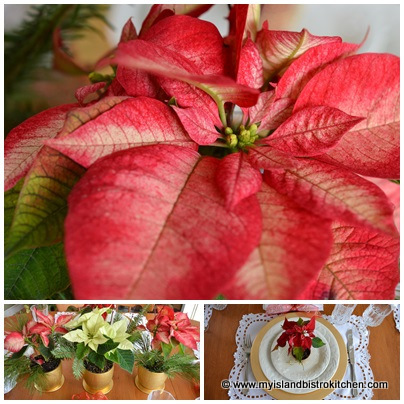 Today, I have turned my table back into its oval shape, bought more miniature poinsettias for guest favours but have used the same three small poinsettias for the table centerpiece. This is a very economical way to achieve a centerpiece for more than one dinner party (and less work!). 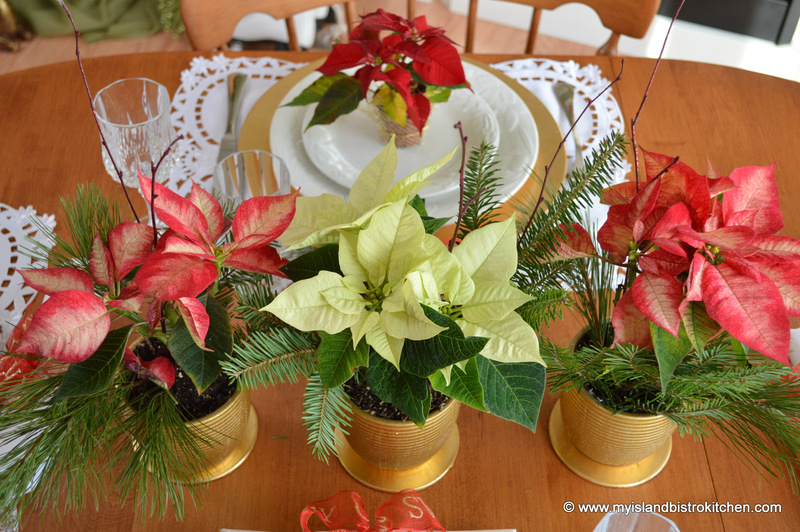 Instead of clustering the 3 poinsettias into a centerpiece, I have placed them at equal distance apart down the center line of the table. 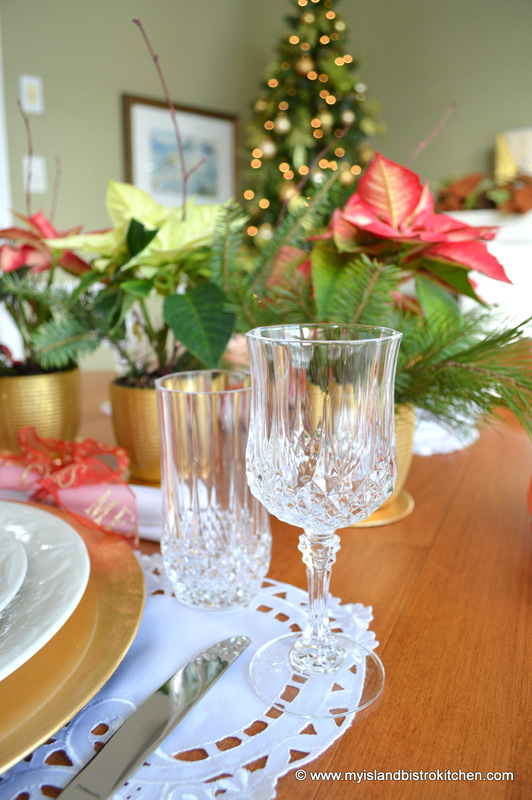 I have decided that, this year, I want my tablesettings to show the maple wood in my table as opposed to covering it up with a full tablecloth. 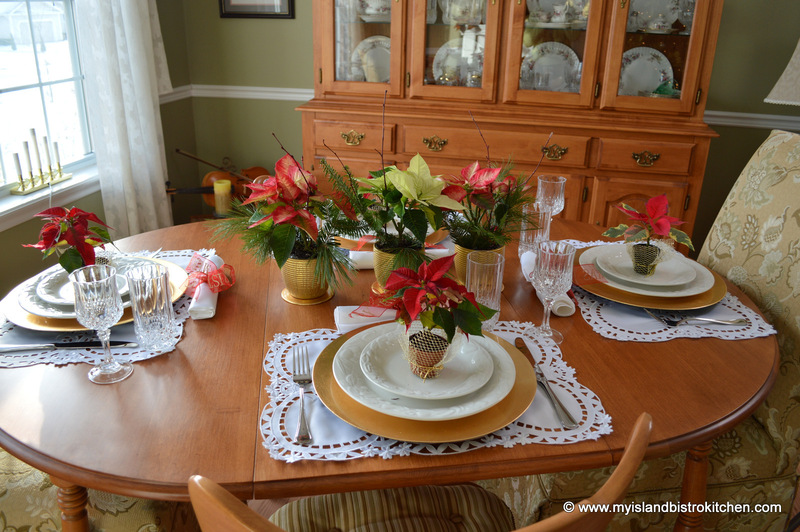 I bought the placemats and matching napkins on a trip to San Juan and it’s a wonderful memory of a great vacation each time I dress my table with them. Letting the wood of the table show lends a slightly more casual look to the table than does a tablecloth. 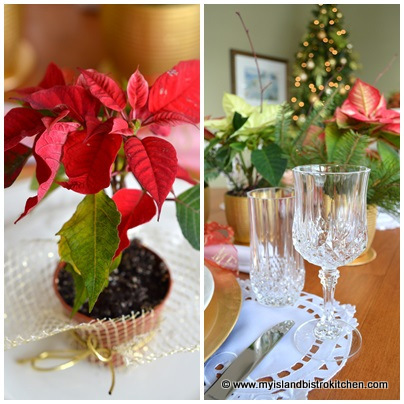 I purchased several of the miniature poinsettias at the beginning of the season and have used them on bed trays, tea tables and, of course, at placesettings on the dinner table. 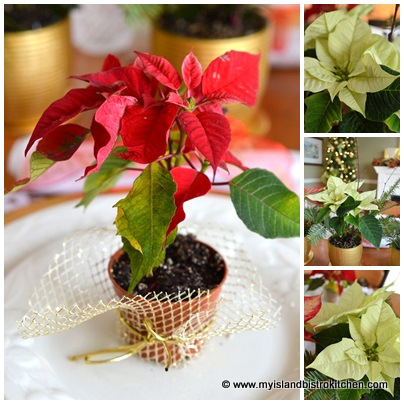 The miniature poinsettias came in little plastic terracotta pots so I simply wrapped them in gold sparkly netting and tied them with gold cord for a festive look. They make great take-away guest favours. 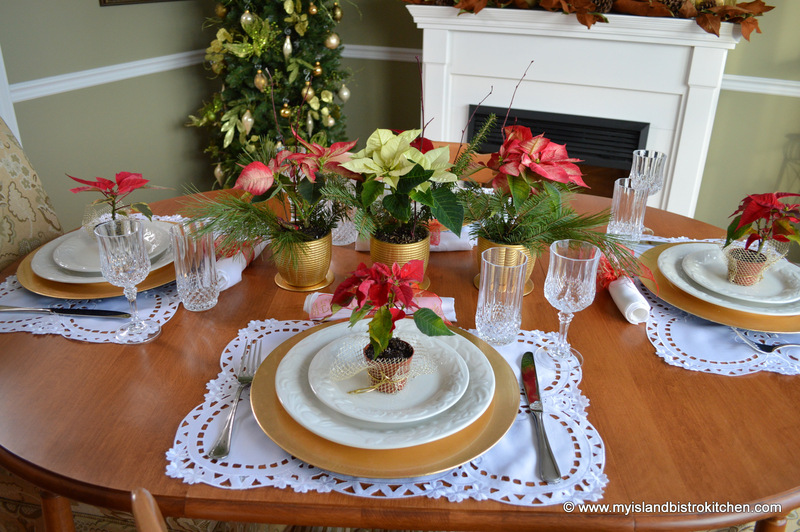 For those who regularly follow my tablescape segment on my food blog, you will recall that I have previously said that, if you aren’t knacky with, or don’t have time to do, fancy napkin folds, then a simple and effective way is to simply use a napkin ring and roll or fluff the napkin through the ring. 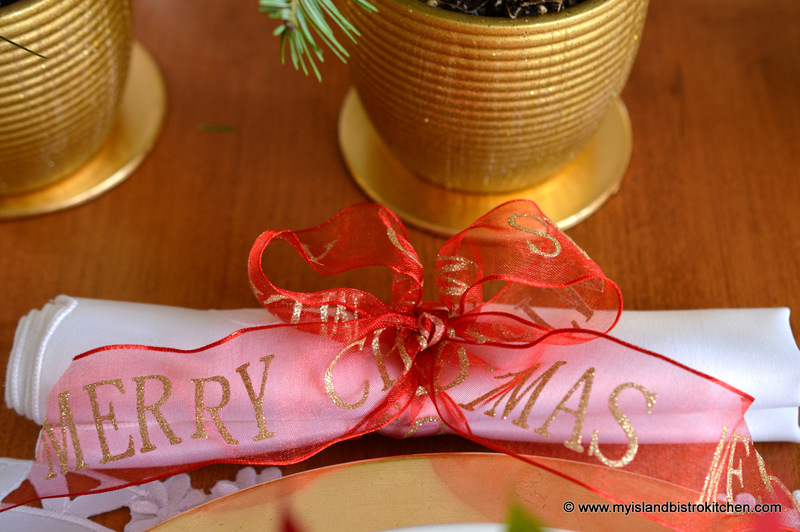 However, if you don’t have napkin rings, all you really need is a spool of pretty ribbon to tie around the napkin as I have done here with a sheer organza wire-edged ribbon that bears the words “Merry Christmas” in gold glittery print, again tying in the gold color and the red of the poinsettias. 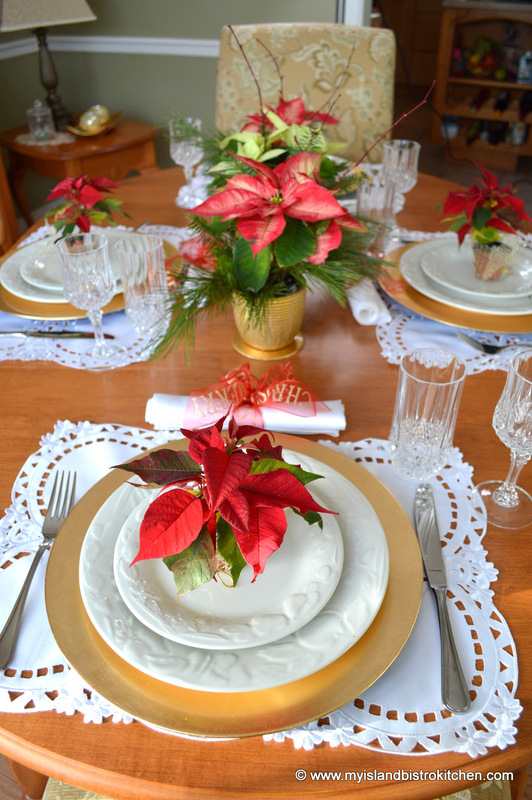 The photo below shows the individual placesetting. 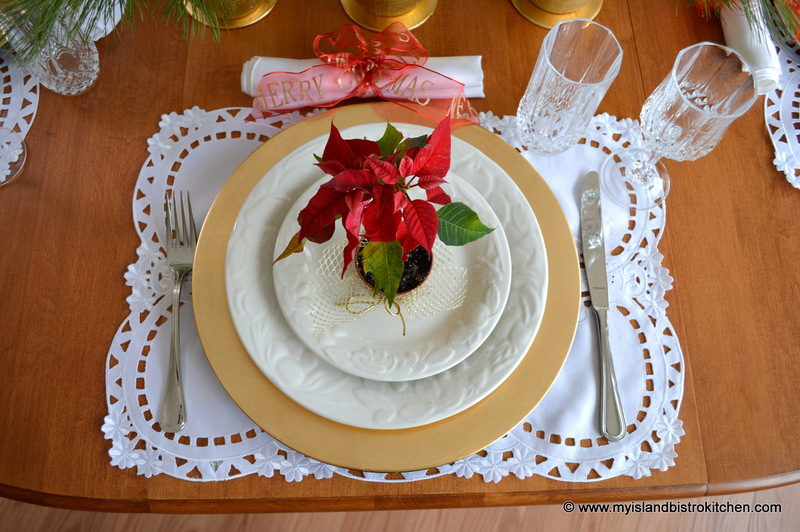 You don’t need expensive formal China to set a pretty table. This one is set with basic everyday ironstone dinnerware. 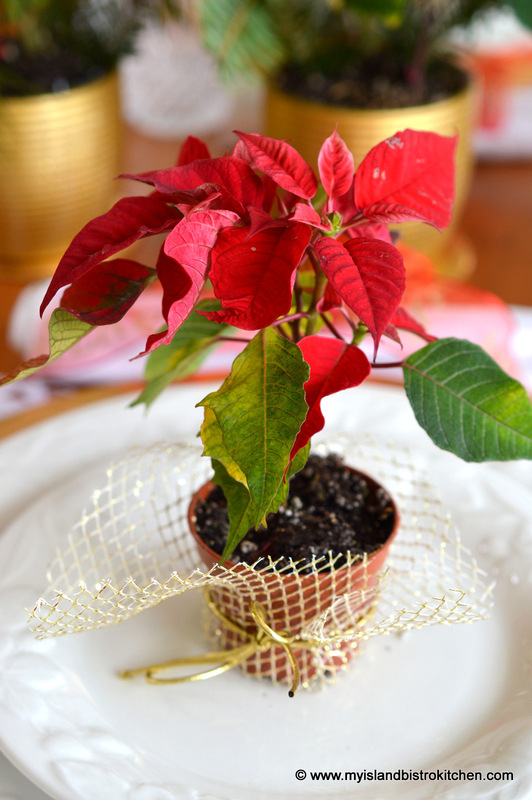 Again, I am using my basic gold chargers to tie in with the poinsettia gold pots. 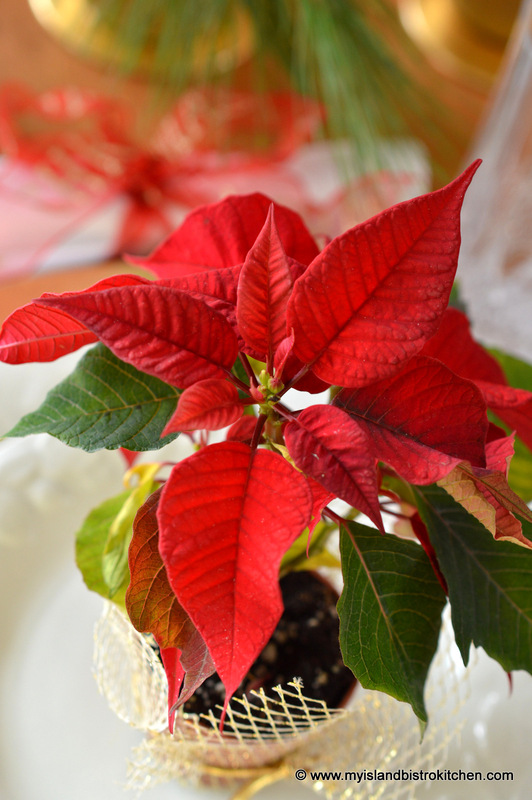 The photo below shows an overhead view of my colorful Christmas table.